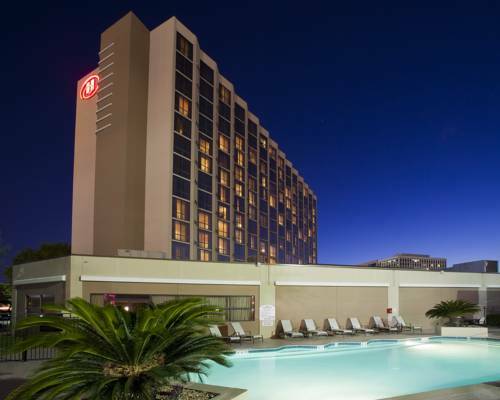 This hotel is 100pct non-smoking With a complete interior renovation in December 2015 Hilton Houston Southwest is a refreshing conveniently located hotel near the prestigious Galleria area Downtown Houston and several popular Houston attractions. Each of our 100 non-smoking rooms feature complimentary WiFi a 42-inch HDTV premium cable selections room service a mini-refrigerator laptop-sized in-room safe an armchair with ottoman alarm clock radio large work station with desk-level outlets iron/board Cuisinart single serve coffeemaker and a separate vanity and hairdryer. Additional amenities at the Hilton Houston Southwest hotel include complimentary WiFi in all meeting space on-site restaurant and bar and Starbucks fitness center business center outdoor pool concierge and an on-site snack shop. For our Hilton HHonors guests we offer private access-level rooms with upgraded amenities including complimentary breakfast and evening drinks. The Veranda Kitchen and Bar located within our hotel provides a central location and welcoming bar scene. This restaurant serves approachable familiar American cuisine. Our bar features expertly made cocktails using fresh juices and artisan liquors. At the Hilton Houston Southwest hotel we are all committed to providing the most experienced professional and gracious service - Texas Style. A CREDIT CARD GUARANTEE IS REQUIRED ON RESERVATIONS ARRIVING AFTER 1600/4PM LOCAL HOTEL TIME. INDIVIDUAL PLANS MAY VARY. PLEASE SEE CANCELLATION POLICY FOR CANCEL PROCEDURES OF A GUARANTEED RESERVATION. Veranda serves approachable familiar American cuisine. With something on the menu for everyone the hardest decision no longer is where to go to dinner but what to have at Veranda. We welcome you to our home here at Veranda.